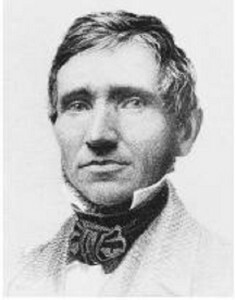 Goodyear was born on December 29, 1800, in New Haven, Connecticut, to a family of modest income. As a teenager he joined his father’s hardware business, but in 1830 the business went bankrupt. During the next 10 years, both while in debtor’s prison and in intervals when he was free, Goodyear turned to inventing and received several patents for improvements of basic items like buttons, air pumps, and faucets. Then Goodyear turned his attention to improving rubber products. At that time rubber, tapped from a tree native to tropical America, had been introduced as a waterproofing material. Rubber is a polymer, a compound comprised of long, thin chains of repeating chemical sub­units. Its key characteristic is elasticity, which arises from its structure of tangled polymers that tend to spring back to their original positions after being stretched. Rubber’s commercial future was uncertain because of its disadvantages: it becomes hard and brittle when cold and soft and sticky when hot, losing its elasticity in both cases. By 1830 attempts to solve these problems had met little success. About 1837 Goodyear purchased the rights to a process of treating rubber with sulfur. Sulfur appeared to reduce rubbers stickiness. Experimenting further, Goodyear made his most significant discovery by accident. In 1839 he spilled some sulfur ­treated rubber on a hot stove and left it there overnight as the oven cooled. Noting the next morning that the rubber on the stove was not hard or sticky but rather elastic and pliable, he tested it in cold and heat. It retained its desirable qualities. In 1844 Goodyear patented the process of mixing rubber with sulfur and heating it, calling it vulcanization after Vulcan, the Roman god of fire. The invention was immediately exploited by patent infringers, and Goodyear fought numerous expensive court battles. He traveled to France and England in 1852 to apply for patents, but he was denied in both countries. In order to produce his award­ winning exhibition of rubber products at the 1855 World’s Fair in Paris, Goodyear accrued crushing debts; he was imprisoned for a short time for failure to repay his creditors. Goodyear died on July 1, 1860, in New York City, leaving his family $200,000 in debt. Goodyear’s introduction of vulcanization made rubber a durable, versatile material useful in a variety of applications, particularly in the automotive industry. Goodyear and his contemporaries did not understand how vulcanization changes the properties of rubber. However, it is now known that the main effect of vulcanization is the creation of new chemical bonds that link the material’s tangled polymers together at numerous locations. The resulting network of connections tightens the structure, making it snap back into place more firmly after being stretched. Vulcanized rubber was first used to make machinery components such as belts and hoses, which needed to remain strong even when heated. However, few rubber products actually succeeded in the market until 1870, when American entrepreneur Benjamin Goodrich opened a rubber factory for the manufacture of heavy ­duty fire hoses. His company also produced the first rubber gaskets, bottle stoppers, jar ­sealing rings, and garden hoses. Rubber’s next major application was the bicycle tire. In 1887 British inventor John Boyd Dunlop covered the wheels of a tricycle with rubber tires to make the ride smoother and quieter. The automotive industry took full advantage of vulcanized rubber. When cars and trucks emerged in the first decades of the twentieth century, their manufacturers became the dominant consumers of rubber. Vulcanized rubber was good for making various engine parts and ideal for making tires. Today, 60% of the world’s rubber is used by the automotive industry. In 1898 American industrialist Frank Seiberling founded the Goodyear Rubber and Tire Company in East Akron, Ohio. He named it in honor of the inventor of vulcanized rubber, but there are no other connections between Charles Goodyear and the company. Natural rubber has been almost entirely replaced by synthetic rubbers (materials with similar chemical structure to rubber) and by mixtures of natural and synthetic rubbers. These materials are less expensive to make and more durable than natural rubber. Vulcanization is still a fundamental process in the manufacture of synthetic rubbers. During the twentieth century the rubber industry employed hundreds of thousands of workers around the world. In the spirit of Charles Goodyear, its research scientists and engineers have synthesized innumerable new polymers that are at the base of many everyday products, including sweaters, playground equipment, and construction materials.